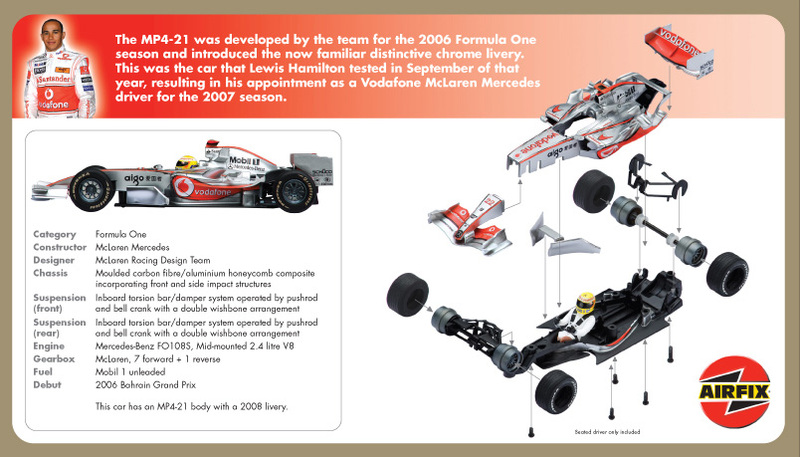 The Lewis Hamilton / McLaren Airfix kit can now be pre-ordered here in time for Christmas! Good news for everyone who’s watched the now-famous Abbey advert with the Lewis Hamilton Airfix kit and wondered whether they’d ever get the chance to buy one. For months all Airfix had been able to say was that they were “in discussions” about producing a model – but today the news appeared that they’ve got the green light and the kit will be available “soon”. No word on when that actually translates to – for example, whether it will be available for Christmas – but the pictures now available of the packaging show it’s more than just an outline agreement, as there are some pretty detailed diagrams. For the purists, it’s a bit of a mish-mash – the chassis is the MP4-21, which Hamilton used for the Autumn 2006 test that secured his race seat, but the livery is this year’s. In fact, looking at the details that have been released today, this kit is not actually very much like the one in the advert at all – the box art doesn’t have that lovely 1950s feel and there aren’t lots of little bits of grey plastic to pop off their spindles. But that has its compensations. Anyone worried about their ability to do all the fiddly bits of painting and assembly that you see in the ad need have no fear, as it comes pre-painted and only actually has 17 pieces in total. You will need a screwdriver, though. No word on price yet, but at 1:32 scale and more than 14cms long it’s a fair bet it will cost a little more than the 1:72 scale Spitfire we all learned our glueing and painting techniques on. We’ll keep you posted on when it’s actually released, but in the meantime here’s the wording on the Airfix site and the box art (click for larger versions). 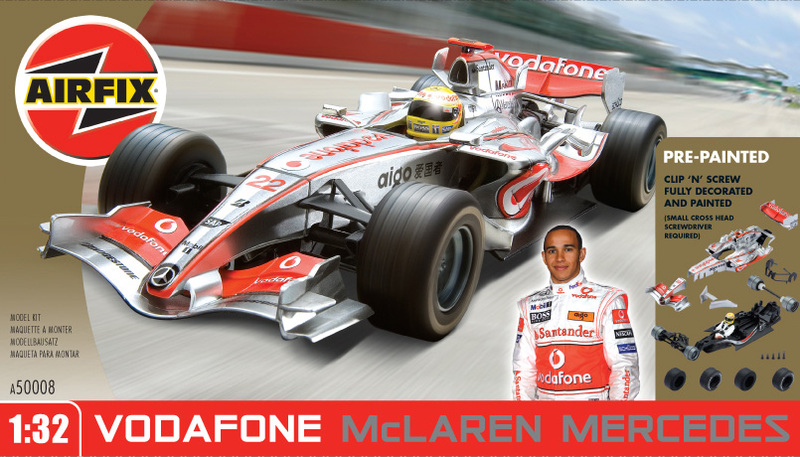 Following the recent popular Santander/Abbey Bank TV advert which features Lewis Hamilton as a Airfix kit, we are now pleased to announce the release of a Vodafone McLaren Mercedes kit! The kit contains 17 pieces with a total length of 148mm and width of 58mm. All parts are pre painted and a small cross-headed screw driver is required to complete the model. This kit will soon be available in all good model stores and online! The box front - not quite as in the ad, but very modern and whizzy. The back of the packaging, with lots of detail about the construction. Looking for Lewis Hamilton gifts? See our guide to what’s available here! What a pity they aren’t producing a proper build it yourself kit with all the little grey plastic bits & retro box art. This is a quick fix kit for todays kids with a 25 second attention span. We want the model as seen on the Tv coimmercial! I suspect this version will be greeted happily by a lot of Dads who are relieved to be spared the disappointed howls and accusatory glares from their kids when they make a mess of trying to put together and paint the one in the ad! Looking at the airfix kit and the way you screw it together, then compairing it to the scalextric car which happens to be in the same scale are we just being fobbed off with a unbuilt scalextric car with no motor? where the glue and paint fun of that? What we want is the Kit in the advert. Still mines on order, and unlike my dinky toys I will be keeping it boxed. Categorised under Uncategorized, tagged under Airfix, Lewis Hamilton, videos.